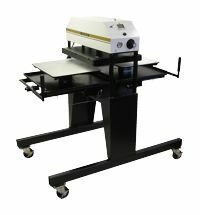 The 394TS Shuttle Press is a high production, twin station heat transfer press. This model has a standard sized 16" x 20" heater block and lower platens. Designed for optimal pressing efficiency in a demanding heat transfer production environment, the 394TS Shuttle Press removes operator inefficiency and pressing delays in a compact and user-friendly design. By utilizing two shuttling tables, the press allows for constant pressing, and the operator is able to load and unload work while the opposite table is being pressed. The next set of work is immediately available for pressing after the prior cycle, therefore minimizing both operator and press idle time. Coupled with the Digital Knight state-of-the-art control system, and a solid steel and casting frame structure, the 394TS provides extended dependable service in even the most demanding production environments. The 394TS exerts up to 12,000 pounds of force, the capacity necessary for Embossing. The high wattage heater in the 394TS will keep up with any heat demand, ensuring absolutely no heat recovery issues often found with standard presses. The 394TS is configured for standard T-shirt and textile printing, and is easily adapted for other substrates such as ceramics, woods, metals, mousepads and fusing and laminating applications. Custom sized and shaped bottom table castings available for specific layout requirements. Ships via LTL Freight. Contact us for freight quote.